Volunteering abroad, and international travel in general, is expensive. There’s no way around it. Vaccinations, insurance, volunteer program fees, airfare, visas, spending money… it all adds up! In fact, many of our volunteers fund raise for some or all of these expenses when planning their volunteer trip to Uganda. Here we share a few ideas that have worked for them. Feel free to try a few and let us know the results! There are a tonne of great crowdfunding platforms out there these days. Past volunteers have used VolunteerForever.com. They have a secure platform that connects your volunteer trip fundraiser directly with our programs. It takes 60 seconds to set up a profile. It’s easy and fun to share on social media as well. They also have an independent review section so you can review your volunteer abroad program once you get home. Take your time explaining the purpose of your trip to your followers. No spelling mistakes! Keep people involved every step of the way with stories and photos of your preparations. Have a clear budget set out at the beginning, and inform everyone when you receive a contribution. Slow, consistent promotion and growth is the key. Get started early! Have your family and friends over and cook a huge meal inspired by your destination country. Pinterest is a gold-mine for international meal ideas. Make it BYOB to cut your costs. Have everyone throw $10 or $15 on the table to cover food expenses. Explain how the funds left over will help fund your volunteer trip. This is a great way to initially get people involved in your trip. You can clearly explain your goals to the group in person. While you’ve got everyone together, why not hold a small auction? People can bid on a gift basket or a cake. How about offering your own yard work, car wash, or cleaning services? After a couple drinks, this gets fun! Promise them a post-trip slide show or a handmade souvenir from your travels as a thank-you. And don’t forget to plug your crowdfunding page. There are a number of t-shirt companies helping individuals and groups to raise funds. My favourite is Ink to the People. You design the t-shirt and they take care of everything else, like inventory, packing, and shipping – with no risk to you. I don’t know anybody who doesn’t love a rad t-shirt. Don’t forget to buy one for yourself to wear while you’re volunteering abroad. Canvass for used household items, clothing, and books. People love donating their old stuff when they think it’s going to Africa. The popularity of e-readers has people getting rid of their print books anyway. Gently tell your donors you’re not actually carrying their (heavy) items around the world. Rather, the funds raised from their sale at home will be used to benefit your destination country’s people and support its economy. I bet folks will appreciate your understanding of economic development and sustainability, and will start looking for even more items to donate to your sale! 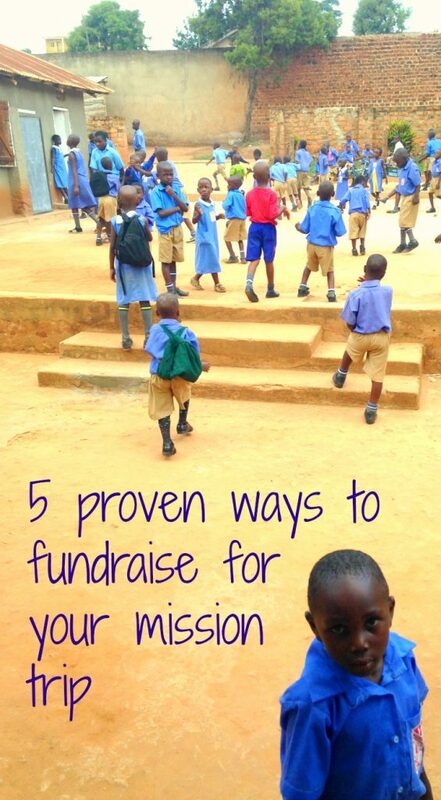 This is a great way to get your cash poor friends involved in fundraising for your mission trip. If you or someone you know works in food service, ask management to set aside a day or evening when a percentage of the meals or drinks sold can go toward your cause. Offer to do the promotion and bring in new customers during non-peak hours. That way you bring value to that business beyond the humanitarian aspect. If it works, there may be opportunities to reprise the event. Good luck with your fundraising and don’t forget to let us know how it goes. Got any more great ideas to get people involved in your volunteer abroad trip? Comment below or contact us!